Type Locality Nile R., Egypt. Etymology The generic name comes from the Mozarabic bagre, taken from the Greek pagros, meaning a fish (Dentex sp.). 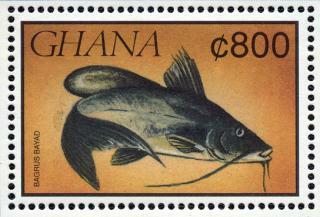 The specific epithet comes from the Arabic name of the fish (bayad). Size 720mm or 28.3" SL. Find near, nearer or same sized spp. Identification Distinguished in having dorsal fin rays produced into short filaments, predorsal distance 2.4-2.6 times in standard length and head width 1.7-2.2 times in head length. General Remarks Occurs in water less than 12 m deep. 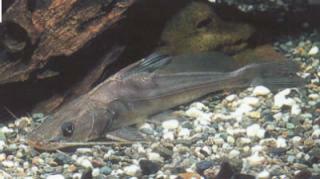 Preys on small fish, particularly Alestes spp., also feeds on insects, crustaceans, mollusks, vegetable matter. Distribution Africa: Nile River, Lake Chad, Niger and Sénégal River, Lakes Mobutu (Lake Albert) and Turkana. Reported from Sanaga River basin. Feeding Readily feeds on live/frozen foods and other prepared foods such as pellets. Will eat smaller fishes.